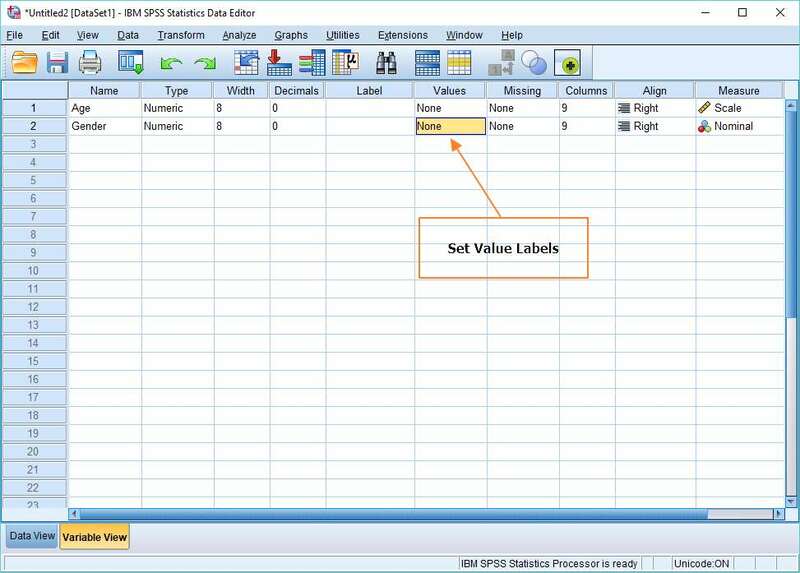 This tutorial will teach you how to define variable values and display value labels in the SPSS statistics package. The best practice for SPSS is to code variables numerically whenever possible. 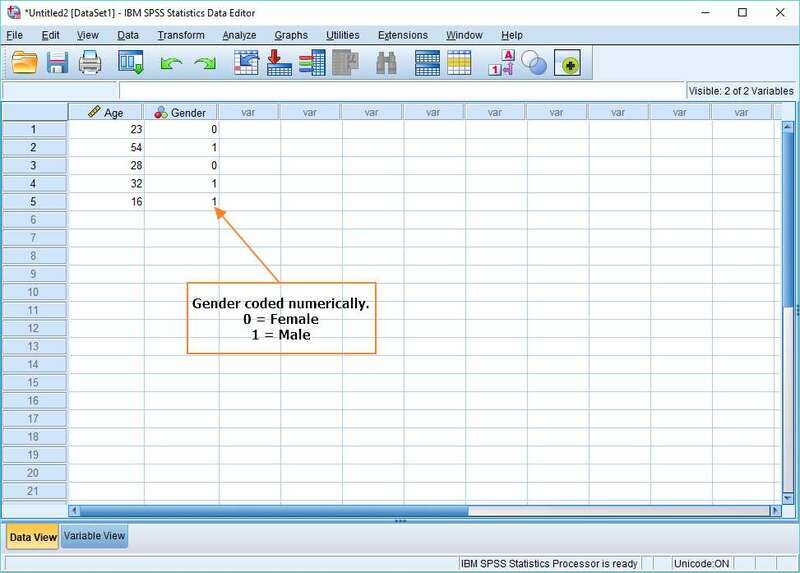 You can see here that we have coded the Gender variable as either 0 or 1, where 0 = Female, and 1 = Male. However, there is a significant drawback to coding in this fashion. Numbers tell you very little about what they’re designed to represent, whereas words do. Just consider the difference between 0, 0, 1 and Female, Female, Male. The way around this problem is to get SPSS to display value labels in the Data View. The Values attribute within the Variable View allows you to specify text values that are associated with particular numerical values, and then to view these text values (value labels) within the Data View rather than their numerical equivalent. To set this up, switch to the Variable View, and then click on the cell in the Values column corresponding to the variable you’re interested in (see above). Click on the ellipsis, which will bring up the Value Labels dialog (see screenshot below). Enter a numerical value for the variable corresponding to the first of the numerical values you’re using to code your variable – in our case, that’s a zero. 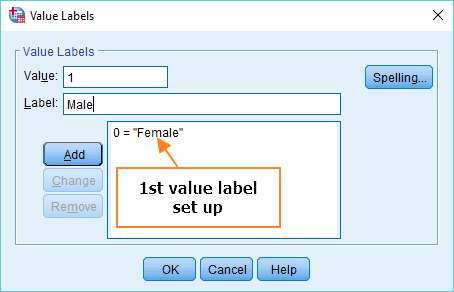 Then enter the value for the Label, which is the text you want to associate with the numerical value (“Female”, in our example). Click Add, and then either add another value label (and so on), or click OK to finalize your changes. Now if you switch back to the Data View you can see a bit of magic. If you hit the toggle button (as above), you’re able to switch between the original numerical coding and the new value labels. The value labels are much easier to read, which is the advantage of setting them up, particularly if you have more than 2 possible values. That’s it for this tutorial. 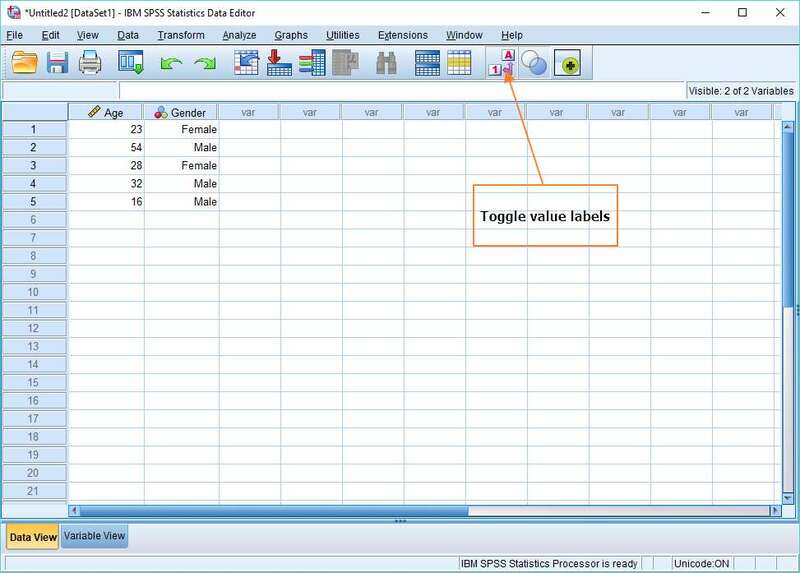 Hopefully, you now know how to set up variable values within the Variable View, and use value labels in the Data View of SPSS.